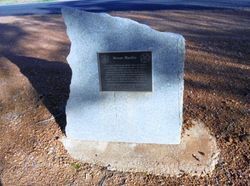 A plaque commemorates the first sightting of the Avon Valley by Ensign Robert Dale. In July and August 1830 Ensign Robert Dale of the 63rd Regiment, accompanied by William Locke Brockman and two other men, explored the country east of the Darling Range and discovered the Avon Valley. Brockman and Dale formed an exceedingly favourable impression of the region, as did Lieutenant Erskine, who explored the area a few weeks later. On November 12th, 1830 the district was declared open for settlement, and notice given that "a town to be called York will be laid out in a situation near Mount Bakewell”. There was an immediate rush to select land on either side of the river from Beverley to Northam. 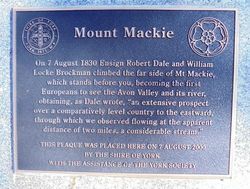 On 7 August 1839 Ensign Robert Dale and William Locke Brockman climbed the far side of Mt Mackie, which stands before you, becong the first Europeans to see the Avon Valley and its river, obtaining, as Dale wrote "an extensive prospect over a comparatively level country to the eastward, through which we observed flowing at the apparent distance of two miles, a considerable stream."